Okay friends, I have a HUGE Christmas present for you from a dear friend of mine. She is the sweetest, most humble woman you would ever meet, and has a talent bigger than life. Her name is Stephanie and she lives here in my neighborhood. She surprised us this year with a Christmas song she wrote for the primary children in our church. She felt inspired to write this song for awhile and I don’t think she could have ever guessed how many lives she has touched by writing this song. I have absolutely NO musical ability. I am practically tone-deaf. It really is embarrassing ;/ It’s okay, I’ve come to appreciate the fact God gave us all different talents and this just happens to not be one of mine 😉 For that reason, I feel an immense amount of gratitude for people who are willing, and able, to share their musical abilities with others. Some day, when I die, I hope to sing with the Heavenly Chorus and share my testimony through song. For now, I am SO grateful my friend has given me permission to share her beautiful song with you. Beware, you will need some tissues! This song is simple in it’s message, and yet filled with a depth of spirit that will touch your heart. The words to this song are so tender and sweet. The words bear testimony of our Savior Jesus Christ and our desire to be His disciples. I can’t wait for you to watch this music video. We had a neighborhood Christmas party tonight where 75 children dressed up in a nativity costume and sang this song for over 200 people. The children’s faces are as sweet as this song. If you love Christmas songs, this one is going to quickly become your favorite! 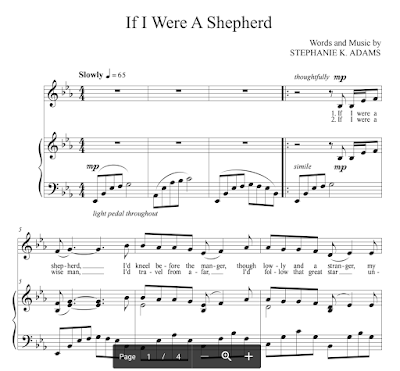 Stephanie has been so kind and is willing to share the music to this song for FREE. Download the song HERE so you can enjoy this song in your own home. Or, even better, teach this song to children in your neighborhood to help spread the good news of the Gospel of Jesus Christ. Merry Christmas! Grocery Deals: Week’s groceries for 7 people for only $142!